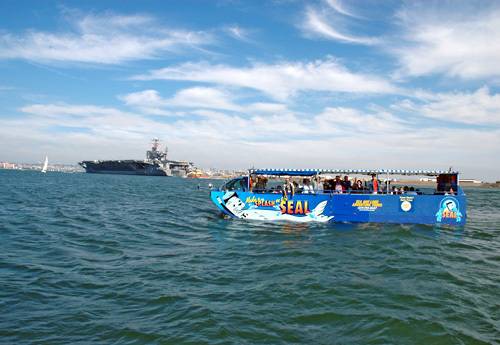 Tour San Diego from the perspective of land and sea on an exciting SEAL tour. 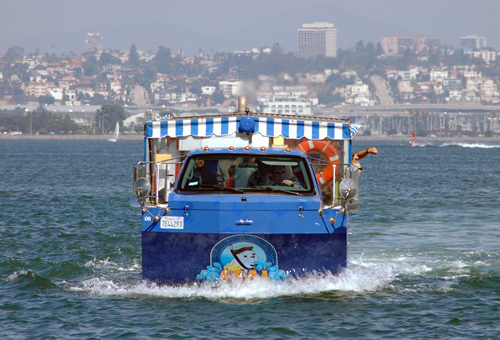 As San Diego’s only amphibious tour, you’ll drive through the city’s stunning streets before making a splash into the harbor. 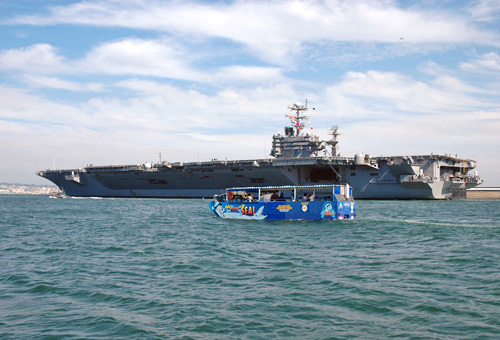 See top landmarks and icons including Point Loma, the Scripps Institution of Oceanography, and Shelter Island. 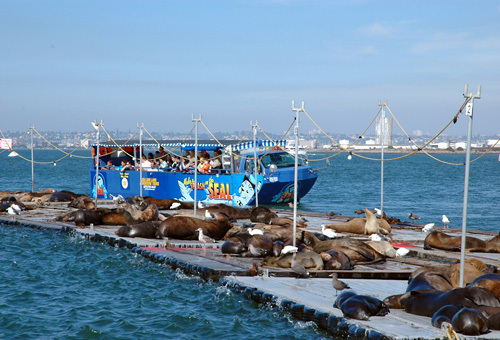 Remember to be on the lookout for resident sea lions basking in the San Diego sun! This 90-minute fully-narrated journey departs from Harbor Drive located at Broadway Pier. As you travel along the beautiful Big Bay by land, you will learn about the early fishing industry, the people as well as the history of this 14-mile long working bay. The tour on land takes you past the San Diego International Airport dedicated to aviator Charles Lindbergh, just one of the many people you will hear about on your tour. 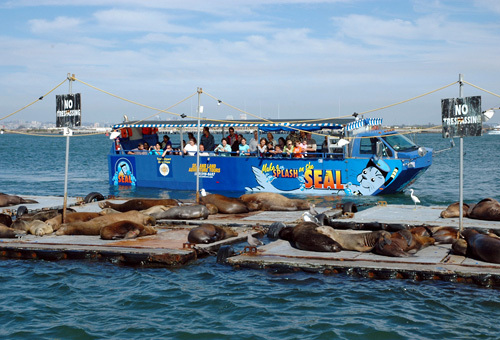 While you may see a seal on the tour, you most likely will see sea lions. 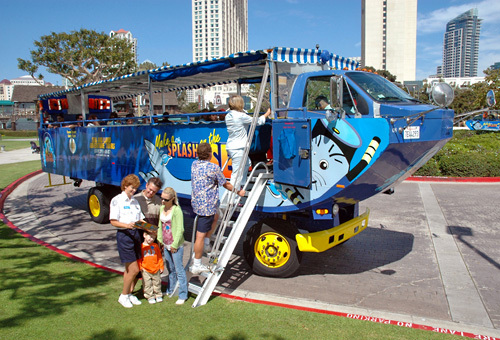 The name "SEAL TOURS" is an acronym for "Sea And Land" Adventure tour. Tour is not wheel-chair accessible from Embarcadero. Guests must check in 30 minutes prior to departure. Guests are advised to arrive 1 hour early before departure time during busy season. Late check-in may result in forfeited reserved seat. Closed on Thanksgiving and Christmas Days. Special events, weather and low-tide conditions may cause delays, detours or cancellations. Special Events: Rock & Roll Marathon-June 5; Comic-Con Convention-July 21-24; July 4th celebrations; AFC Marathon-August 21; Balboa Park December night-December 2 & 3. 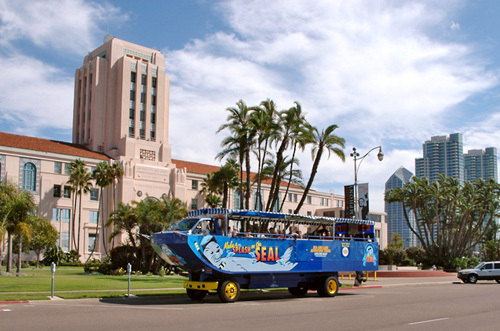 San Diego SEAL tours are 90 minutes long. Absolutely. SEAL tours are fun for all ages! The name "SEAL" is an acronym for "SEa And Land" adventure tour. No. However, it is possible for a few drops of water to splash up from a wake. It is extremely unlikely. However, if you are extremely susceptible to motion sickness, you may want to take something for your own comfort. The vehicle has a weighted, flat bottom, which allows for a much smoother ride. We recommend wearing comfortable clothes and bringing a light jacket. Can I bring food and beverages on the tour? Yes, food and drinks are welcome. However, alcoholic beverages are not allowed under any circumstance for the safety and comfort of all of our guests.